MOSCOW, Russia -- The ending was hardly unexpected, but still a shock. After 69 years, three men got together at a hunting lodge and finished off the Soviet Union. Defying an appeal by Soviet President Mikhail Gorbachev, about 10,000 miners rally in the Ukrainian city of Donetsk, calling for nationwide support for their six-week-old strike. The slogans on the placards read: "We are starving, we are fed up with promises," and "Communist Party dictatorship to the waste heap of history." It was Dec. 8, 1991. A week earlier, Ukrainians had endorsed independence in a landslide, and now the leaders of the U.S.S.R.’s three Slavic republics were huddled in a forest to figure out what to do. It only took them a couple of hours to work it out. The Soviet Union was deathly ill, after an attempted coup, an economic collapse, a string of nationalist revivals, and a protracted moral crisis. President Mikhail S. Gorbachev was valiantly trying to keep the various republics together, but it was more than he could handle. Ukraine was the key — or, more accurately, the final nail. The leaders of Russia, Ukraine and what was then called Byelorussia announced that the Soviet Union was done. They said they were replacing it with a cooperative body called the Commonwealth of Independent States, to be headquartered in Minsk, the capital of today’s Belarus. American officials worried about nuclear weapons. The CIA said a coup was likely. As it turned out, the weapons were taken care of, the coup never happened, and the Commonwealth proved itself to be a phenomenally irrelevant organization. The declaration at Belavezhskaya Pushcha, a retreat in Belarus where Soviet leaders once hunted bison, heralded independence for each of the Soviet republics. 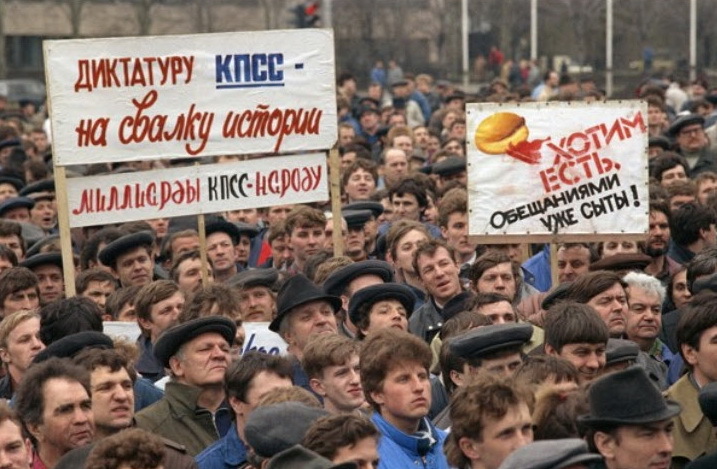 Russian President Boris Yeltsin had apparently hoped to replace the Soviet Union with something like a real confederation — but one without Gorbachev, and one he could dominate. But Leonid Kravchuk, who months earlier had been a member of Ukraine’s Communist Party politburo, balked, and he had his people behind him. The U.S.S.R. didn’t close up shop that day — it had a couple of weeks left to go. But after Dec. 8 there was no longer any ambiguity about it. The three national leaders presented the world with a fait accompli: One of the world’s two superpowers was done for. There were no demonstrations, no refugees, no bloodshed. Yeltsin and Kravchuk were wily politicians who cut their teeth as Soviet apparatchiks. Their host that day, Belarus’s leader Stanislav Shushkevich, was the only one who came out of the burgeoning democratic movement. A physicist who once taught Russian to Lee Harvey Oswald in Minsk, he thought Belarus should look west. He was turned out of office in 1994, replaced by Alexander Lukashenko, who today runs what is called Europe’s last dictatorship.